Flags, Horns, and Walls | "A Song Every Day"
Posted on July 14, 2015 by vspatz	in Ethics and tagged Beyond Walls, Confederate Flag, Kenyon College, Masei, Matot, Mencer Donahue Edwards, Moses' horns. One lesson of the reading seems to be the importance of noting every stage on the way. And the repetition of “journeyed from” — forty-two times! — hammers home the idea that you have to leave one place to get to a new one. But events of recent weeks in the nation, as well as some travel of my own, suggest that recognizing where we are is no simple matter. In South Carolina a few days ago, the Confederate flag was removed from the State House. (See, e.g., Al Jazeera.) Observers reportedly chanted “USA! USA!” as well as “nah nah nah nah…goodbye,” and the removal was heralded by many as a victory over hate and divisiveness. In addition, other instances of the same flag, in stained-glass windows at the Washington National Cathedral, for example, also face possible removal. So, if we had to name this stage in our country’s history, what would it be? Are we making a collective journey at all, if we don’t share a starting point? 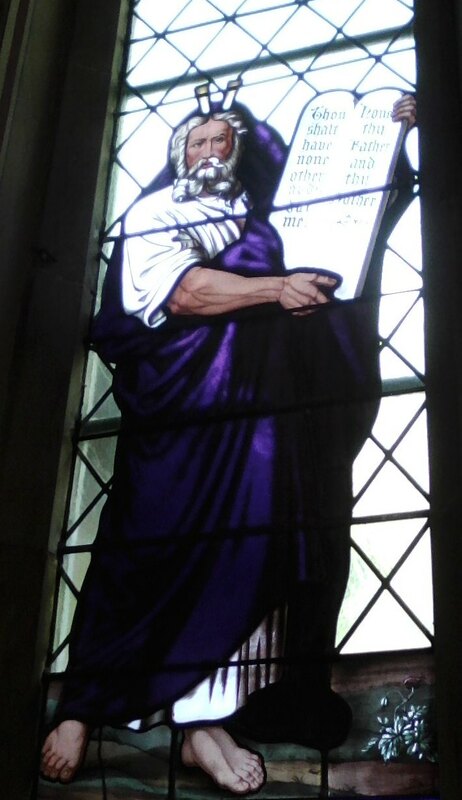 Meanwhile, I am visiting Kenyon College in Gambier, OH, this week, where this image of Moses (right) holds a prominent place in the campus Church of the Holy Spirit. The horns are based, most scholars think, on a mistranslation of the word קָרַן — as “keren” [“grew horns”] rather than “karan” [“sent forth beams (of light)”] in Exodus 34. They appear most famously on sculptures of Moses by Michelangelo and Donatello (both centuries before the window design). The Nazis seized upon the negative Jewish body image and used caricatures and other forms of propaganda to present the Jews as sub-human or as disfigured humans. 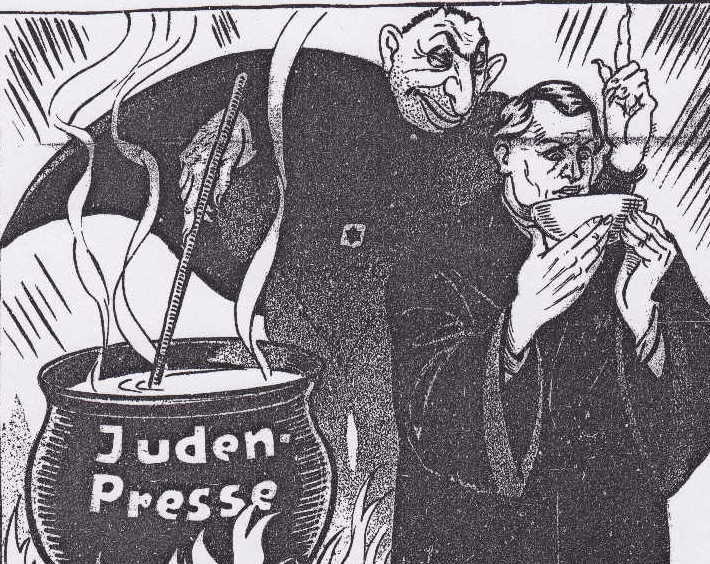 The Nazi weekly Der Sturmer was famous for disseminating these images. (See right, e.g. ; more here). was distracting, but the horns on his head were nothing to write home about? What was the name of that stage? 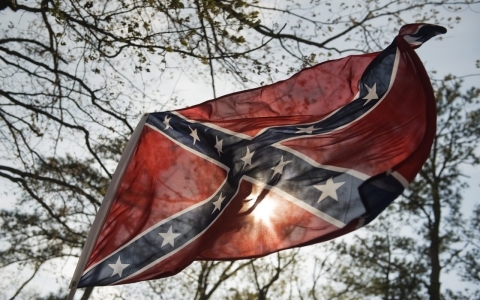 The Confederate battle flag no longer flies on the grounds of the SC State House. But I’m not done. I’m gonna tell a piece of MY southern heritage story. Because it also matters. And it is why the flag had to come down…. My Great Grand Father, Charlie Bulter, was the property of the Butler family…. In my early 30s, I made a tape of Uncle Menk describing the funeral procession of the ‘Old Massa’, General Johnson C. Hagood, who had taken over the former Butler lands and negroes. Uncle Menk, who was in his 80s then, was very precise in his description of how as a boy not 10 years old, he remembers the confederate soldiers in their uniforms, the battle flags, the guns firing a salute, etc. Jr remembers that all the blacks bowed their heads in ‘honor’. For years after their surrender at Appomattox, former Confederates donned white robes in SC as members of the Order of the White Camelia. They fought with black militias, massacred black people across SC, including in Barnwell and Charleston, imposed Jim Crow and re-established the rule of the Democratic Party as the party of “The Redeemers”. …So, for the past 150 years, that [Confederate] flag has represented threat, fear, hatred and death at a personal level in my family and in the families of millions of other black Carolinians. And my family’s narrative is just one reason why the flag did not deserve to be on the grounds of the People’s House of South Carolina. Good riddance. No turning back. Nine martyrs were the game changers. But they stood for 15 decades and millions of lives who paid before they did. What do we call the stage where an inflammatory image goes unnoticed? How can we move “beyond walls” if we don’t even see them? And how do we balance remembering with moving on? This week’s reading is the double portion Matot and Masei (Numbers 30:2-36:13), read together in non-leap years. For more on Matot-Masei in this blog, use the tag function. 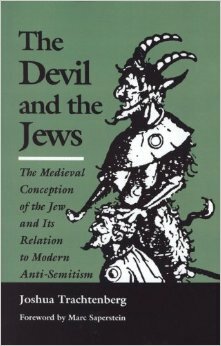 See also, My Jewish Learning on Mattot and Masei. וַיְהִי, בְּרֶדֶת מֹשֶׁה מֵהַר סִינַי, וּשְׁנֵי לֻחֹת הָעֵדֻת בְּיַד-מֹשֶׁה, בְּרִדְתּוֹ מִן-הָהָר; וּמֹשֶׁה לֹא-יָדַע, כִּי קָרַן עוֹר פָּנָיו–בְּדַבְּרוֹ אִתּוֹ. וְרָאוּ בְנֵי-יִשְׂרָאֵל, אֶת-פְּנֵי מֹשֶׁה, כִּי קָרַן, עוֹר פְּנֵי מֹשֶׁה; וְהֵשִׁיב מֹשֶׁה אֶת-הַמַּסְוֶה עַל-פָּנָיו, עַד-בֹּאוֹ לְדַבֵּר אִתּוֹ. And the children of Israel saw the face of Moses, that the skin of Moses’ face sent forth beams; and Moses put the veil back upon his face, until he went in to speak with Him.